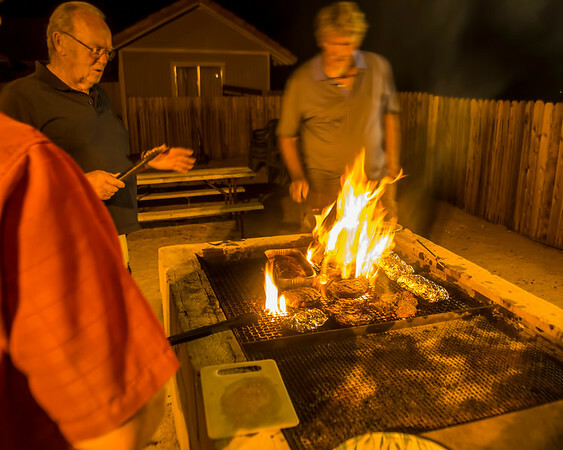 After a wonderful Potluck Thanksgiving Dinner Thursday afternoon with nearly 50 guests...we kept the weekend going with our regular Friday Evening Campfire and fired up the BBQ. 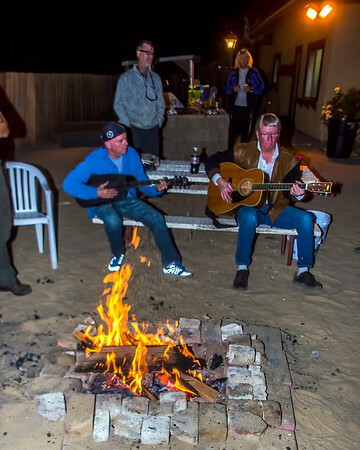 We had a few guest musicians jam around the Fire and enjoyed a nice evening with some great music! 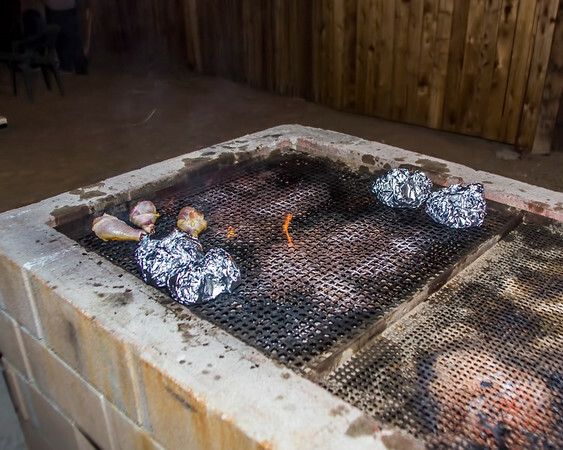 A few brought some things for dinner on the BBQ! 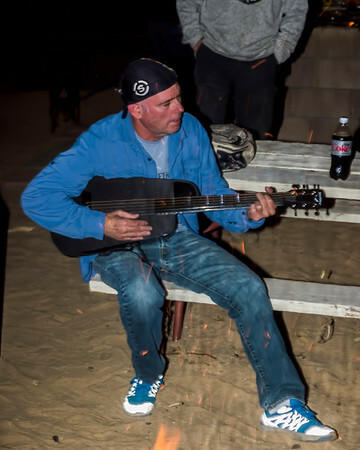 The crowd varied throughout the evening, but some great sing-a-longs and fun! 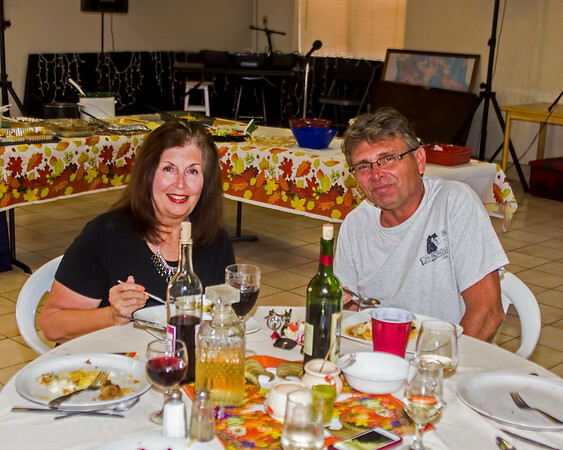 We followed Friday Evening with our regular Saturday Evening Dinner in the Clubhouse and enjoyed Thanksgiving Left-overs! 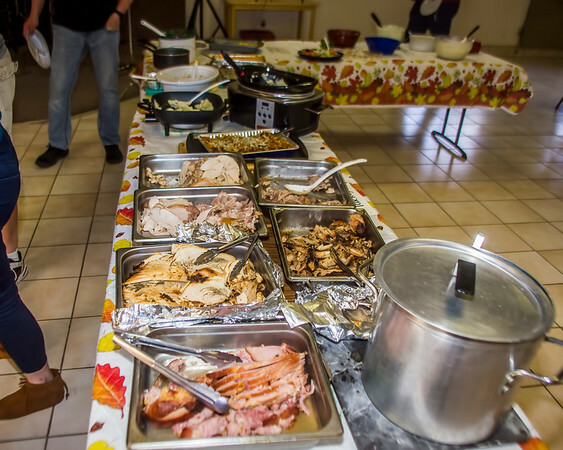 Our kitchen crew did another fantastic job of saving all the leftovers and getting things all warmed up for a fantastic Buffet! 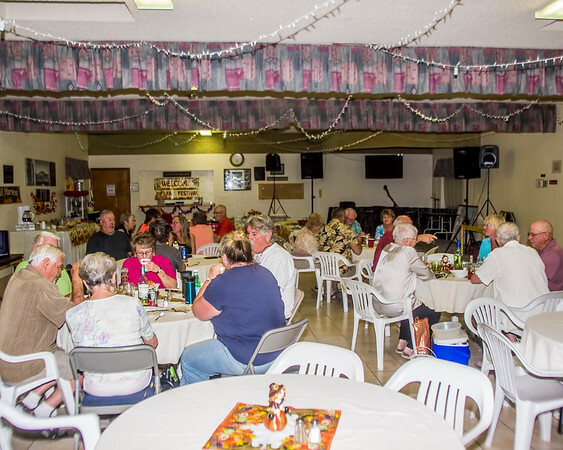 Plenty of fun left this season - Make Plans to head this way - we are taking reservations for our wonderful New Years Celebration with a Prime Rib Dinner and Music and Dancing, get your reservations in, this event fills up fast! 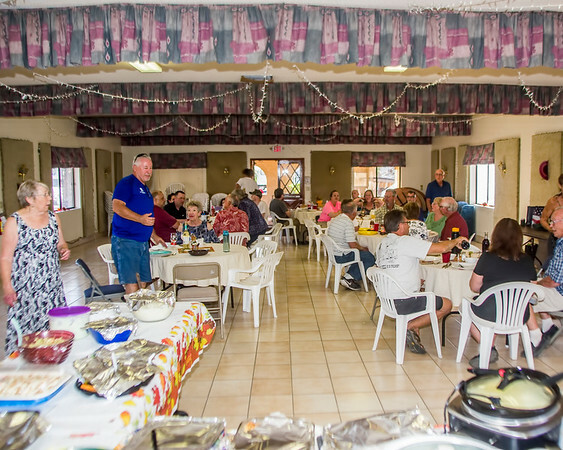 Make plans to spend Christmas Week and New Years here in the park and enjoy another wonderful Pot Luck on Christmas and then a festive New Years Eve with a wonderful dinner! 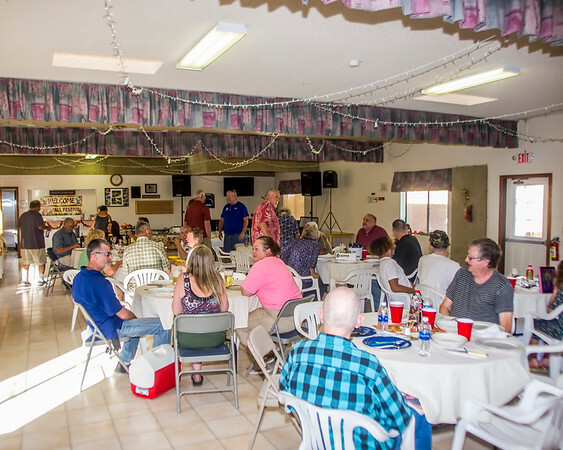 We had a really nice crowd of nearly 50 people for a wonderful Pot Luck dinner in the Clubhouse! 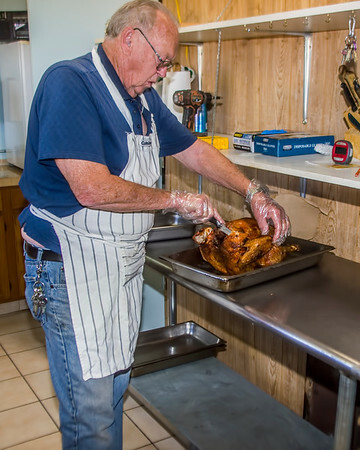 The park furnished the Turkeys and Ham and as usual our Kitchen Staff, did a superb job of making sure everything was perfect! 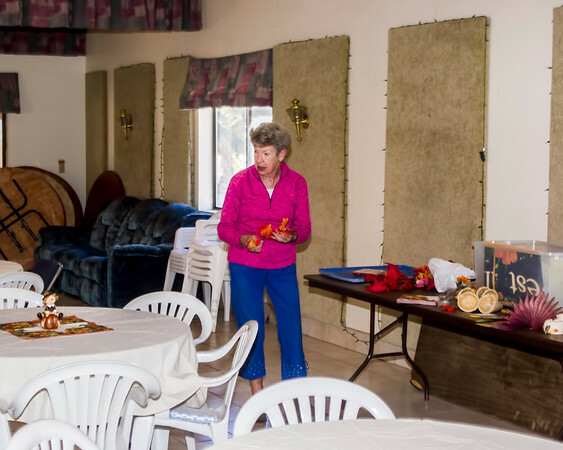 Shirley H - helped get some decorations up and did her usual fantastic job! 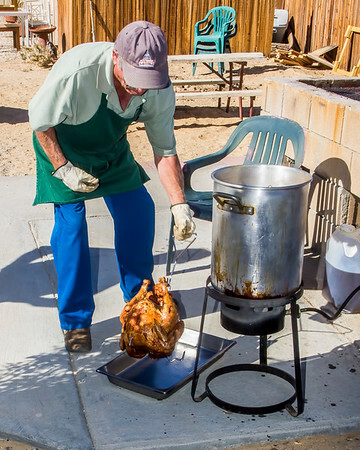 Don Nobert handled the deep frying of the Turkeys and as always were perfect! 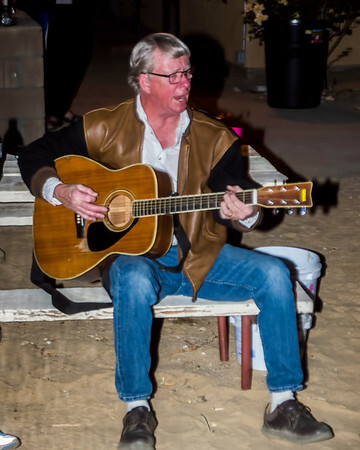 Jim Prestwood handled the carving! We were joined by our past Activity Directors - Pat and John...Hope to see you again soon! 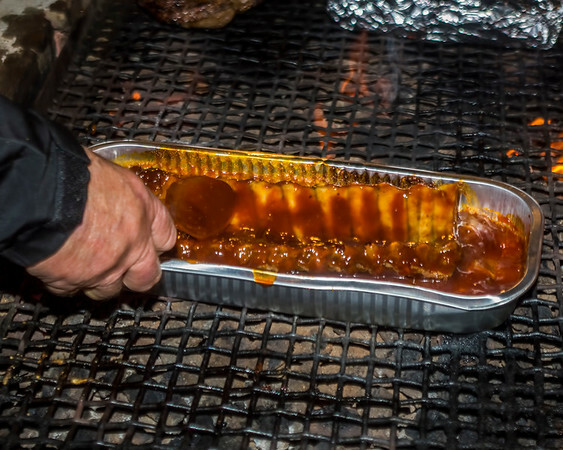 The Buffet Line was amazing! 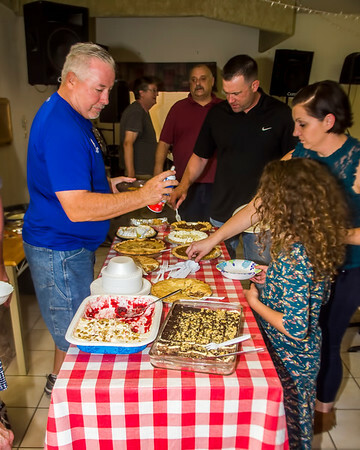 The Dessert Table was sinful! 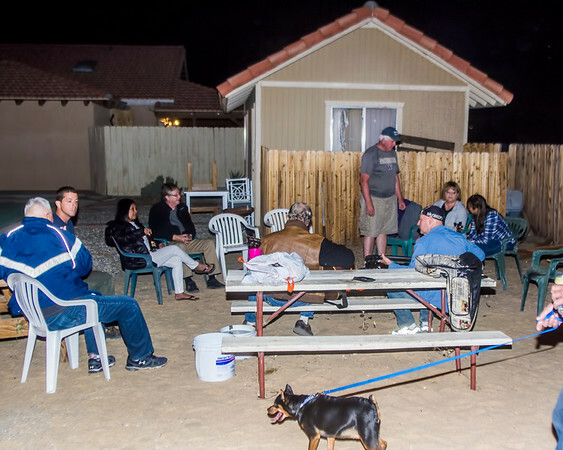 We are off to another great season here at Twentynine Palms RV Resort - our old friends are arriving daily and many new people are discovering our friendly park! 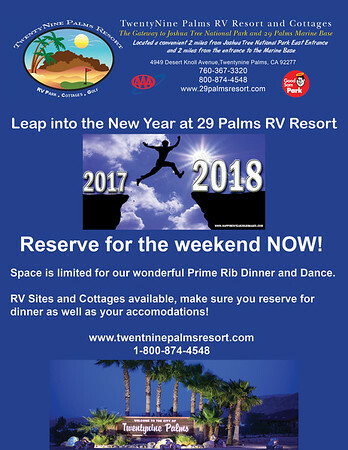 Make Plans for New Years - we expect a crowd so make reservations for not only your RV Site but dinner and dance as well! 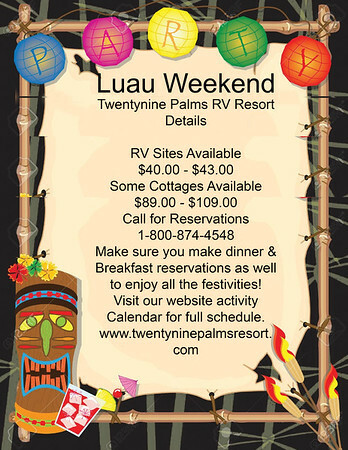 Luau Weekend is not far away either and filling up fast! 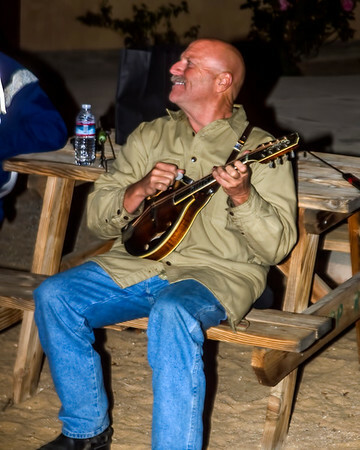 Come join us at one of the friendliest and active RV Parks in the warm weather! Seasons First Saturday Night Dinner! 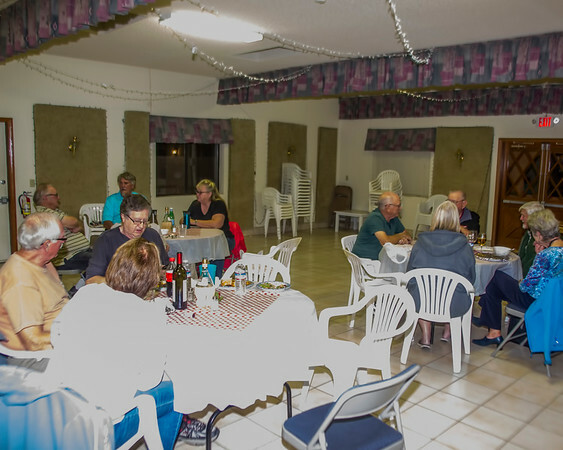 The Clubhouse came alive last evening with a wonderful Spaghetti with meat sauce dinner, Garlic Bread a wonderful salad and ice cream for dessert! Miss Lori as usual outdid herself with a great delicious meal! 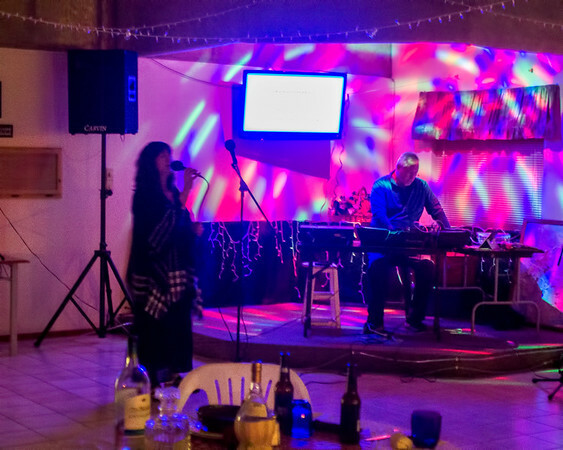 We had a nice group of about 20 people and our new workampers provided some wonderful Karaoke after dinner for entertainment! Had a minor camera malfunction so only a couple pics! 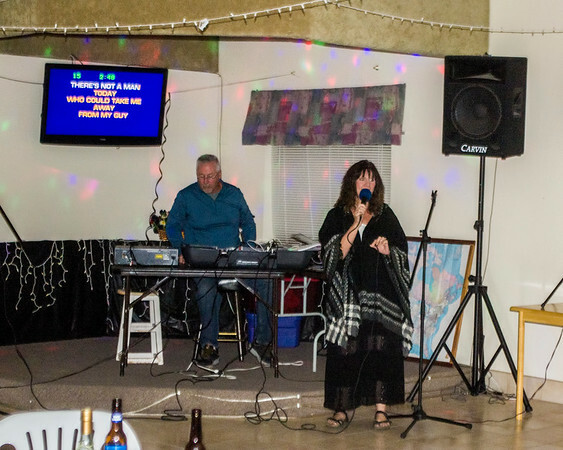 Rick and Valerie providing some wonderful music - the voice of an angel! 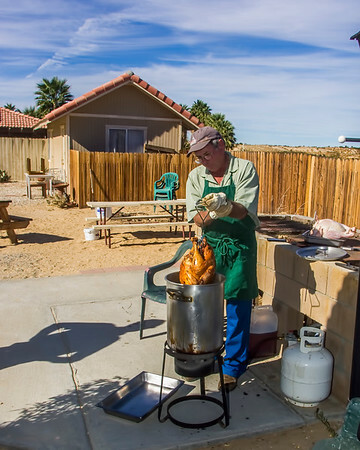 Stay tuned for much more fun in the clubhouse this season - have a wonderful Thanksgiving Dinner planned this week, make plans to join us! 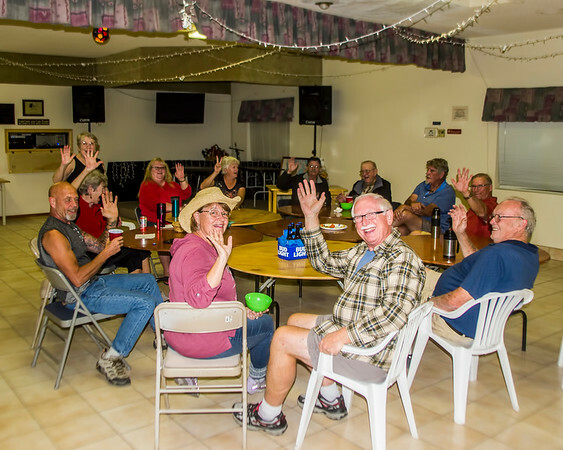 The winter season officially got started last evening in the Clubhouse with a nice group of about 20 old friends and new friends for our first Happy Hour of the winter! 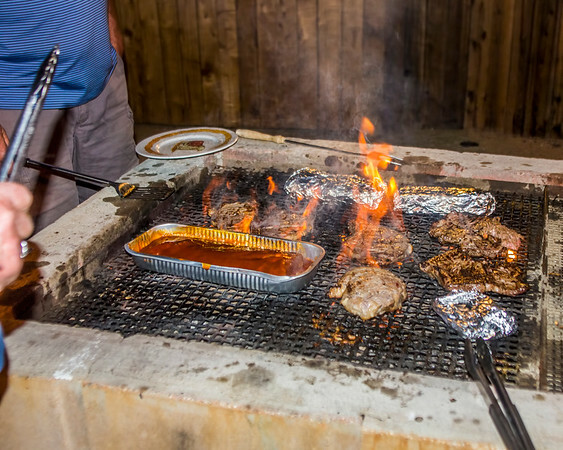 Make plans to attend every Wednesday at 4:30 - BBQ starts around 6:00 pm. This Saturday Evening we start our dinners in the Clubhouse, we start with Italian night - Spaghetti and Salad and Garlic Bread and dessert! Make sure you sign up in the office! Here is most of the group waving at those who are still on their way South! BBQ had a Good assortment of meals! 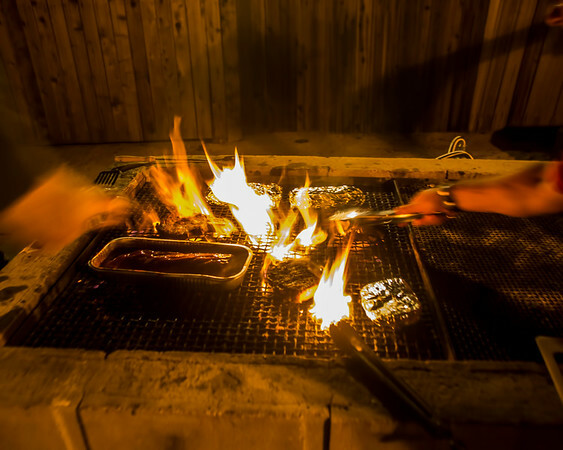 Friday evenings is campfire night and the BBQ is also lit for community cooking! 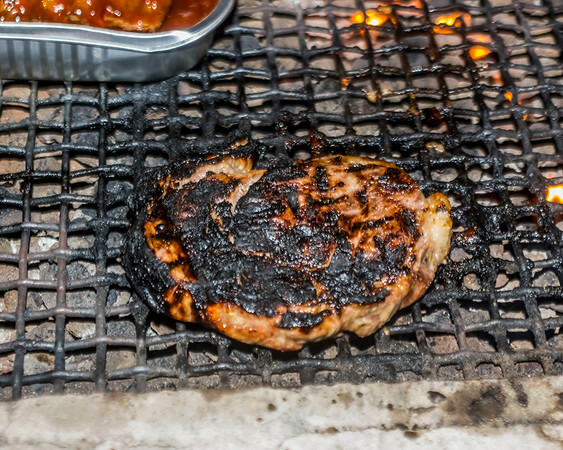 The Fun is Just Beginning - Hurry down here for all the fun!